After you’ve determined which products or services make money and which ones take money, evaluate which ones to invest in by looking at how attractive the market is. A widely used tool for conducting a portfolio analysis is the Market Attractiveness Framework, which provides a structure that works with your products and services as listed in the previous section. The framework looks at your portfolio based on the strengths of each product or service and its market attractiveness. The example in the figure provides a good picture of where a company should invest to yield the biggest growth in the upper-right-hand part of the matrix. 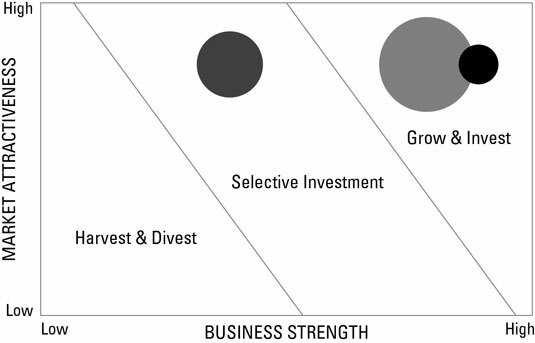 Use the Market Attractiveness Framework to determine your product portfolio in relation to market attractiveness and business strengths. The method of using the Market Attractiveness Framework is to fit your products or services in one of the three areas. Determining what factors make a market attractive and what are product and/or service strengths can be difficult to pin down. A healthy dose of intuition is also helpful when determining where to place your products and services in the framework. Based on where these items fall, you can use the recommendations here to help guide your planning efforts. The more attractive the item, the higher up you place it on the vertical axis of the framework. The less attractive it is, the lower you plot it. Determine the business strength of each product or service. The stronger it is, the further to the left you place it on the horizontal axis. The weaker it is, the further to the right you plot it. After looking at business strength and market attractiveness, you can put together your own framework similar to the example and arrange every primary product or service somewhere in the three areas.